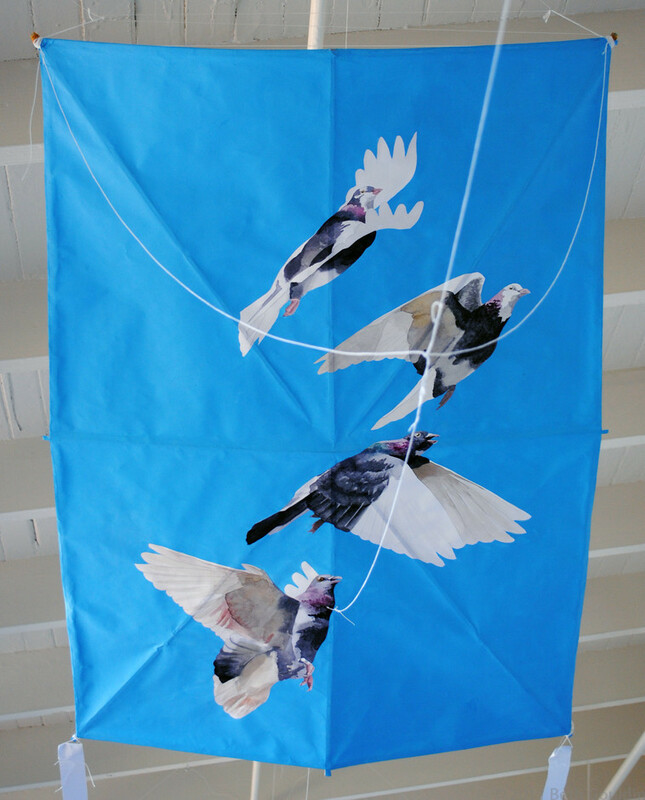 Tsugaru kite–masa/washi, bamboo, nori paste, cotton string Painting – watercolor and gouache Approximately – 40”x30” $350 Typically, my view of these particular birds is far less romanticized and usually involves dodging and ducking as I bike through a flock of them. You can find them in every part of the city and most (including myself) would consider them vermin. One day though, I experienced a surreal moment while working my way through the chaos of the 16th and Mission BART station. Between navigating around the many homeless who sit outside of the station and dodging the pigeons, I was annoyed. Then, for some reason, the hauntingly beautiful song “feed the birds” from Mary Poppins came into my mind. If you don’t remember or have never seen it, youtube it. I was so struck by my own self-absorbed tendency to brush past and ignore the street people like so many pigeons, merely obstacles to avoid in my daily life. This painting is a reminder to care.